This recipe can be found here. It is also located on page 34 of October/November 2011 issue of Healthy Cooking. I love to cook using my crock pot so I had to try this recipe. 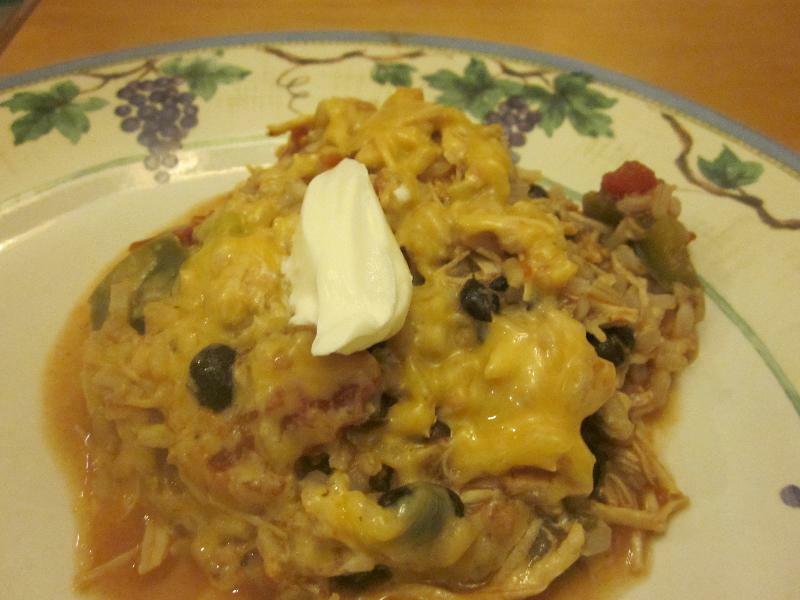 I LOVED it!What is not to love -chicken, beans,rice, and cheese?! I will be making it again. I did leave out the ground chipotle pepper as I am not a fan of spicy foods.The diced tomatoes with the mild green chilies add just the right amount of kick for me. This is so easy to make my 3 1/2 year old helped to make it. In a large bowl, combine the tomatoes, green peppers, onion, garlic, paprika, salt, cumin and chipotle pepper. Pour it over the chicken. Cover and cook on low for 5-6 hours or until chicken is tender. Stir in the rice and beans. Heat through. Garnish with the cheese and sour cream.